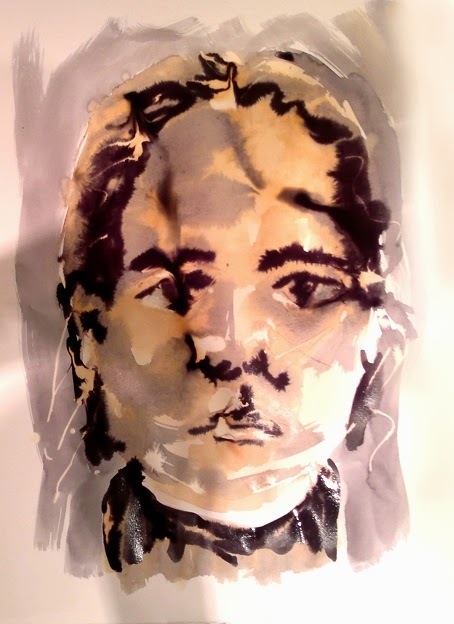 The project in one of my process art classes a few months ago, was to do a series of Self Portraits using clay, charcoal, and tea, coffee and ink. For the first one we were given a mirror and a large lump of clay. Sitting comfortably and holding the clay in our hands, we did a guided meditation. 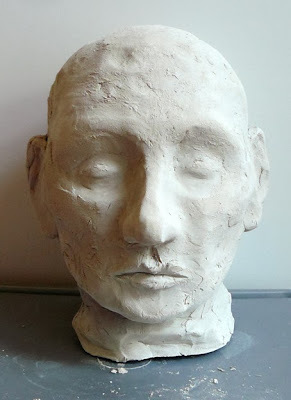 We then placed the clay on the desk in front of us and with our eyes closed, were instructed to carefully and slowly feel our face, ... our ears, ... our head ... and our neck. We did this a few times using both our hands, first our fingertips and then our whole hand. When we were done, we started to mould the ball of clay into a self portrait. We could look at our refection in the mirror and at times we closed our eyes and worked intuitively, feeling our way around the clay and occasionally referring back by feeling our faces and heads with our hands. 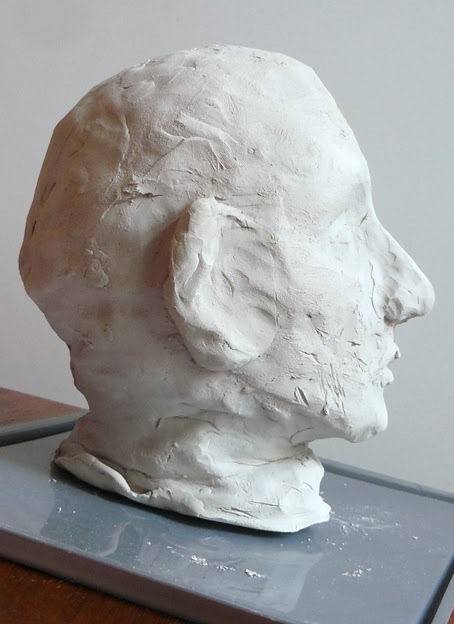 You would think that with all this care taken to explore your own face, and to carefully mould it out of clay, you would manage to achieve a pretty close resemblance of yourself in your final sculpture. Is this an expression of tension you feel which you don't show the world or words left unsaid? Fascinating process Wendy, as always - thanks for sharing it! Making self portraits is serious business you know ;) Thanks Molly for your (insightful) comments. 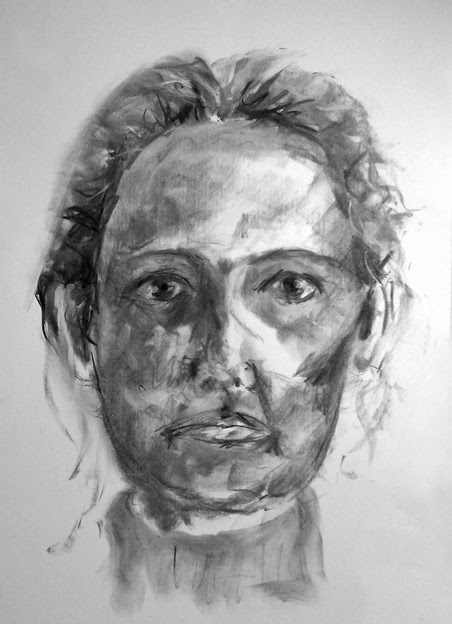 I'd bet you'd do other people's portraits far more realistically, I hope you didn't think I meant you don't have the talent - you do, I've seen the paintings in your home, just not the insight into your own looks - for who of us do? Have you seen the Dove Real Beauty clip? I actually thought of the Dove Real Beauty clip when I read your first comment. Self portraits are often harder to do than portraits of others and can be quite 'revealing'. These sketches were done quickly in just a few minutes each. The paintings you've seen took months and were often repainted and corrected again and again. 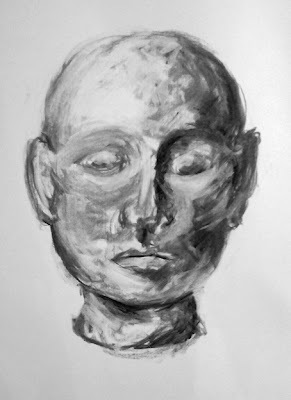 I find charcoal sketches quite hard to do so tend to avoid them. They're not as easy to 'correct'. :) But these were fun to do.